Recent research has found that Brazil is the worst place in South America to be a girl. With high rates of teenage pregnancy and child marriage, many young women in poverty are deprived of an education and leave school with few employment prospects. One study found that 1 in 10 girls are married by the age of 15. 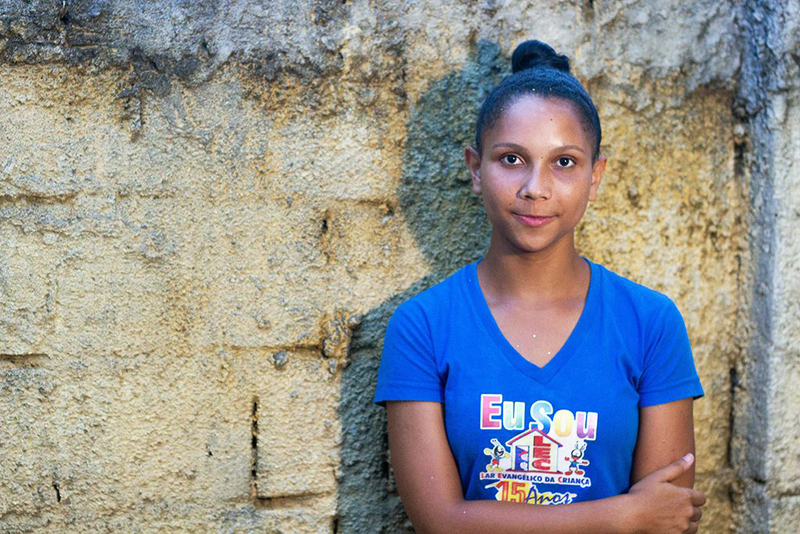 Many girls living in poverty in Brazil lack trusted sources of advice and guidance on issues such as women’s health, relationships and education. Our new campaign is aiming to change this by empowering 10,000 girls in Brazil to make informed choices about their futures. 'Handbook for Girls: Empowered to thrive' will see every young woman aged 12–20 in Compassion’s Brazilian church-based projects given a handbook with vital information on topics including their health, self-esteem, education and employment. The books are being developed by programme staff in partnership with child development experts, including psychologists and education professionals. Each book costs just £2 to produce and distribute, and we're aiming to raise enough to ensure all the girls in Compassion’s Brazilian projects can receive a copy. What’s more, our church partners will receive additional training in how best to support girls in the topics covered in the handbook and boys will participate in workshops on the value of women. Virginia Silva (far left) directs a Compassion project in Brazil. She explains why protecting and empowering girls is so vital. "Each girl has a different story, but they all find something common among them, whether it’s an abuse experience, or the mother who got pregnant very young, or parents who didn’t have the opportunity of education. 17 year old Jailma’s parents died when she was very young. She explains that growing up alone in a culture that sees women as inferior is very hard. "The home where I was born never gave me the basis for a decent future. So being in the [Compassion] project helped me to question the world around me. I want a different future for me." "I want to be a cop, but many people never think I’ll be able to because I’m a woman. I want to… show that we also have value, and we can also go far." We're right with you in thinking it's an injustice that poverty deprives girls of education and leaves them vulnerable to early child marriage. You can help stop this by donating to 'Empowered to thrive' today. You can also text EMPOWER to 70140 to donate £4 which provides two handbooks. Text costs donation amount of £4 plus standard network charges. Compassion UK receives 100% of your donation. Please obtain bill payer's permission before texting . Customer care is available on 01932 836 490. Registered charity in England and Wales (1077216) and Scotland (SC045059).